Scroll down for the pattern download links. This is another one of the general type of decorative gourds called bottle gourds or pear gourds because of their shape, but this variety features a striking sharp colour change between the base and the top. They almost look as if they have been dipped in paint! The pattern shows you how to make a smooth transition from one colour to another in crochet – there is no unsightly ‘jog’ where the colour changes. 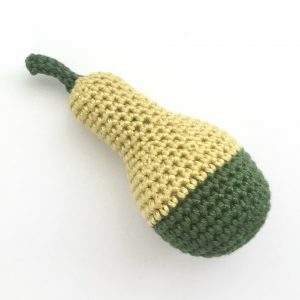 Using DK (light worsted weight, Category 3) yarn and a 3.5mm (US size E-4) crochet hook this pear gourd is approximately 10cm long (not counting the stalk). 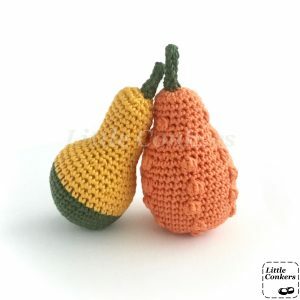 But you can choose a different weight yarn and appropriate hook to make larger or smaller gourds. 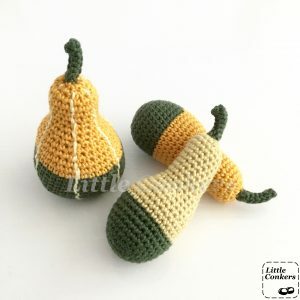 The pattern includes several ways to vary your gourds, so that if you are making a collection, they will each be unique, just like in nature. 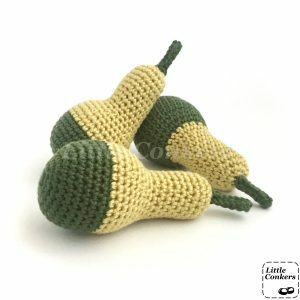 You may also have noticed this pattern is called Bi-coloured Pear Gourd #1 – that’s because another pattern is on its way for another one of a different shape, this time with stripes! Watch this space! These gourds love to be with their friends, so mix and match them with the mini pumpkins and other gourds in my growing range of patterns to make a fun and beautiful autumn centrepiece. The pattern is available in both UK and US terminology, and is fully-illustrated with colour photos to make it really easy to follow. This pattern is suitable for beginners as it uses on the UK dc stitch (US sc) and its decrease which is taught in the pattern. Don’t forget you can order all my crochet patterns printed and gift-boxed, and these make lovely, easy-to-post gifts for crafty friends. Click here to see more posts in my Pumpkin and Gourd Patterns Series. And of course you can still order my pumpkins and gourds readymade if you prefer. 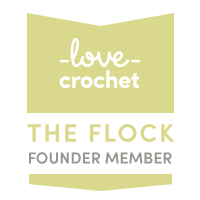 Find the pattern on LoveCrochet. 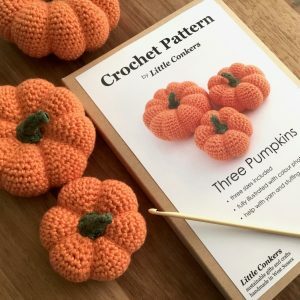 It will be coming soon to Ravelry and Etsy too and I’ll be creating bundles of pumpkin and gourd patterns to give you the best value when creating your autumn fun. Don’t forget to share pictures of anything you make from my patterns with the hashtag #LittleConkers on Twitter, Facebook and Instagram.